The testing of zener diodes requires a variable dc power supply. A typical test circuit can be constructed, as shown in figure 4-19. In this circuit, the variable power supply is used to adjust the input voltage to a suitable value for the zener diode being tested. Resistor R1 limits the current through the diode. With the zener diode connected as shown in figure 4-19, no current will flow until the voltage across the diode is equal to the zener voltage. 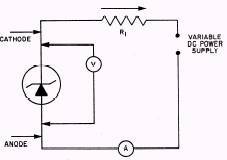 If the diode is connected in the opposite direction, current will flow at a low voltage, usually less than 1 volt. Current flow at a low voltage in both directions indicates that the zener diode is defective. Figure 4-19.�\Testing a zener diode. Figure 4-20.�\Testing an SCR with an ohmmeter. return to its previous high value. Some SCRs will not operate when connected to an ohmmeter. The reason for this is that the ohmmeter does not supply enough current. However, most of the SCRs in Navy equipment can be tested by the ohmmeter method. If an SCR is sensitive, the R × 1 scale may supply too much current to the device and damage it. It is advisable to try testing sensitive SCRs on the higher resistance scales. An SCR can also be tested for switching action and leakage, as discussed in the "Transistor Testing" section of this chapter. Figure 4-21.�\Unijunction transistor equivalent circuit. should indicate low resistances approximately equal to each other. Most transistors that fail do so completely. 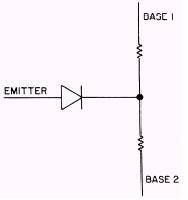 These transistors can be detected by using the transistor gain test. Two exceptions are transistors that are just starting to fail and transistors in critical bias circuits. The quality of these transistors can be checked by using the transistor leakage test. An accurate, easy-to-use transistor tester (fig. 4-22) that allows both in- and out-ofcircuit testing can make you more efficient in troubleshooting solid-state circuits. 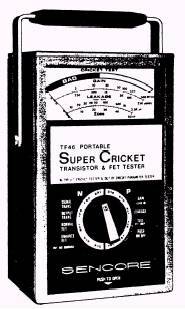 The transistor tester can also test diodes, SCRs, and field effect transistors (FETs). An FET is a device that combines the high input impedance of the vacuum tube with all the advantages of the transistor. For detailed testing information on FETs, consult the transistor tester operator's manual. Figure 4-22.�\Sencore TF46 transistor and FET tester. 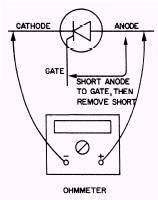 The transistor gain test provides a safe and reliable method of determining if a transistor has gain. The gain test is a Go/No-Go test providing a test tone and meter indication that indicates gain is present. No technical information is needed for testing for transistor gain. The same procedure is used for testing a transistor in or out of circuit. Be sure power to the transistor has been removed and filter capacitors discharged before connecting the test leads. 1. Connect the three test leads to the three leads of the transistor in any order. NOTE: The position (up or depressed) of the PARAMETER SELECTOR buttons (to the left of the PERMUTATOR SWITCH) has no effect on the test. 2. Rotate the PERMUTATOR SWITCH one complete turn while watching the meter and/or listening for the test tone. If the transistorhas gain, the meter will read in the GOOD portion of the GAIN scale in either one or two PERMUTATOR SWITCH positions. 3. If the transistor tests BAD in circuit, check the schematic of the transistor being tested to see if there is a low-impedance shunt path around the transistor (between any two elements). It is recommended that transistors that check BAD in circuit be removed from the circuit and tested again to eliminate the possibility of external' loading. If the transistor now checks GOOD, perform the out-of-circuit leakage check. If a transistor checks BAD in circuit and GOOD out of circuit (including leakage), there is probably something wrong in the circuit.